On a quiet summer evening one can hear the slurping sound of a catfish as he rises to the surface and rolls over in a swell as he devours a small insect or other aquatic life. Anglers use a variety of baits and presentations entice this whiskered wonder. The brushy areas of the coves and along Gun Creek and the Highway 57 bridges are popular hot spots. That is not to mention the action found along the railway, Interstate 57 and Illinois Highway 37 shallows. Boat activity stirs up the shallows and provides and attractant for the catfish to feed on the aquatic life released. The catfish are everywhere. Rend Lake is a 19,000-acre reservoir located on the border of Franklin and Jefferson counties. It is about 300 miles south of Chicago (via Interstate 57) and 100 miles east of St. Louis (via Interstate 64). A Marina on the south end caters to anglers and boaters from across southern Illinois. In late summer the good places for catfish include the whole north end of the lake north of Route 154, in the stick ups and other shallow areas. If there is a north or south wind and the lake is choppy the catfish move deep. Then the fish like the environmental protection afforded by Gun Creek. On windy days fish the creeks and coves. On calm days one can move out into the main lake. Catfish seem to relate to structure. Look for stumps, weed beds, and brush. A lot of Flathead Catfish fishermen tie jugs to the trees along the shoreline baited with live bait. Bluegills are the preferred bait for the big flatheads. Under Illinois law the bluegills used as bait must come from the lake. Some of the rod and reel anglers seeking flatheads suspend a minnow or bluegill about 3 feet below a flat in water with some current. The rod and reel anglers do manage to take some flatheads. It is that they just do not measure up to the really big ones that the jug fishermen seem to take. One of the nice things about Rend Lake is the access afforded the pole and line angler. From both the shore and a boat, it is possible to work the shoreline of the lake as well as the river channels for channel catfish. In the spring, when the water is high with winter run off, the sub impoundment areas are popular catfish locations. During the summer months the fish are plentiful. Only the weather can be a bit oppressive, as temperatures tend to be in the 90-plus degree range with high humidity. Anglers often prefer to fish during the low light hour of late evening or early morning. Night fishing is also a possibility. In late summer, the sub-impoundment areas are normally dry. But the area just below the sub-impoundment dam is a good catfish area. 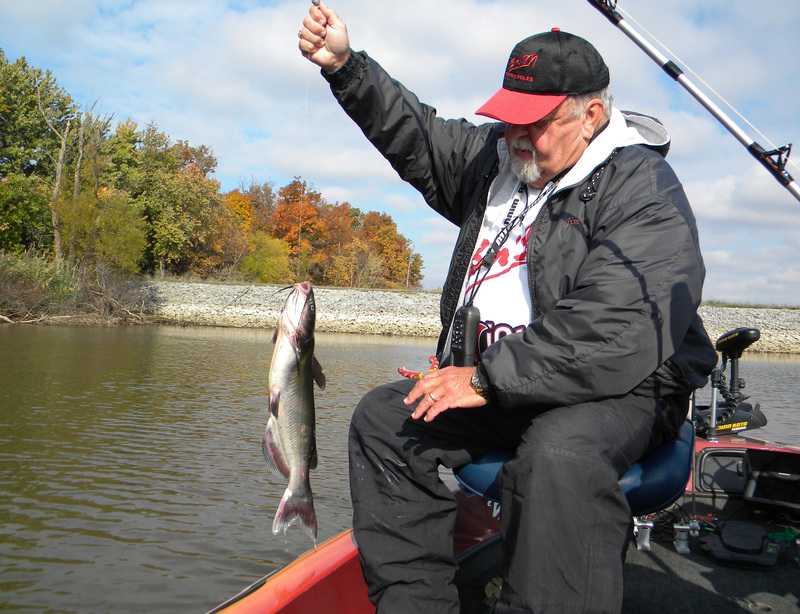 The average size of channel catfish caught is 1 to 1 ½ pounds. That is about average for the lake. Some will get to 2 pounds. All are excellent eating size fish. Most of the line and pole anglers prefer a stiff 6 foot rod. Most veteran catfish fishermen recommend line of the 10 to 20 pound test. A 1/0 hook or something fairly good sized is best. Most anglers tie a sinker about a foot above the hook, right on the main line. That way it sits on the bottom and allows the bait to float just above it. Some will tie the sinker on a drop line off the main line in the same location. The bait of choice for the channel catfish in this area is generally stink bait. Other baits include shad cut into pieces, shad guts, leeches, chicken livers, nightcrawlers and minnows. Rend Lake is a summer catfisherman’s heaven.